Vermont Space Education Program is a partner of Vermont NEA. Aurora image copyright Pekka Parviainen of Finland, image taken October 21, 2003. AURORA ALERT for October 11 and 12, 2007. If Vermont's rain clouds move away and the sky clears in your area, check the night sky around midnight local time. There has been another solar eruption resulting in solar wind heading towards Earth's magnetosphere which could trigger a geomagnetic storm that would result in a display of the Northern Lights (aurora borealis). While we in Vermont think of orange, red and yellow as our fall colors, autumn in the Far North has begun with dramatic shades of green via a display of green Northern Lights. The northern polar area had three days of dramatic auroras as a result of the solar wind stream hitting Earth's magnetosphere on Sept. 21st. Set your alarm or stay up late and check the sky at midnight local time on Sept. 27th and 28th as another solar wind stream is due. Maybe we'll get lucky enough to be treated to an aurora display. For some reason, this is the time of year when the sun is usually the most active, sending coronal mass ejections which produce the Northern Lights. NASA's THEMIS mission (THEMIS = Time History of Events and Macroscale Interactions during Substorms) is a 2-year mission to study the Northern Lights, how Earth's magnetosphere works and the Sun-Earth connection/ relationship. Five identical probes will follow and study the aurora borealis displays near the North Pole. THEMIS scientists will be investigating what causes the displays to change in intensity, ranging from subtle to highly dramatic effects and displays. NASA will launch (with an expendable rocket, not as a shuttle mission) the THEMIS instruments in February (currently scheduled no earlier than February 15, 2007). For more information on the science of auroras related to the mission, click here. For information related to the Delta rocket launch and mission features, click here. On Saturday night, March 18th, a solar wind stream struck Earth's magnetosphere, our protective layer, causing a geomagnetic storm. In the United States, Northern Lights displays were seen as far south as Michigan, Minnesota and Wisconsin. They were also seen in Quebec city in Canada. More geomagnetic activity is possible tonight since Earth is still inside the solar wind stream--so keep looking in the night sky as more auroras are possible for the next few nights. GIGANTIC SUNSPOT: A huge sunspot, "NOAA 822," has been detected on the sun, on the "front side" currently facing the Earth. Measured from end to end, it is wider than Jupiter, and there are M-class (medium-sized) solar flares. So far none of the solar flare explosions has sent a coronal mass ejection toward Earth. However, that could happen at any time. Geomagnetic storms and auroras are possible, if this sunspot hurls a major flare during the rest of this week, or next week. TAURID FIREBALLS: Keep an eye on the night sky for bright meteors during this week. The Taurid meteor shower peaked in early November--which theoretically means it should be subsiding. However, according to reports submitted to the American Meteor Society, it is still producing visible fireballs. The sun has been extremely active for the past few days and the chances of seeing the Northern Lights (Aurora Borealis) is very high for this week as the sun continues to rotate its face toward Earth. Observing tips: The best time to look is usually during the hours around local midnight. Go outdoors for about 20 to 30 minutes earlier to give your eyes time to adjust to the darkness. Turn off as many house lights as possible--or travel to a location with a lot of "dark-sky" (meaning as little light pollution as possible.) Sometimes auroras are bright enough to shine through city lights, but you'll see more from a dark-sky site in the countryside. If you need to use a flashlight, use one with a red bulb, or put red cellophane over the outside of the flashlight's bulb to be kinder to your eyes and see more detail of the aurora and constellations. Mild auroras are possible tonight and tomorrow night when a coronal mass ejection (CME) brushes past Earth's magnetic field. The CME was blasted into space on July 30th by an X-class explosion from sunspot 792. Because the blast wasn't squarely Earth-directed, the CME's impact will be, at most, glancing. This reduces the likelihood of a very intense display--but should cause minimally, a lovely glow in the night sky. Northern Lights displays were spotted on July 28 and 29 in the US as far south as Wisconsin and Washington state. As anticipated, an active sunspot group has emerged over the sun's eastern limb, and it is slowly turning to face Earth. If the spot's recent high level of activity continues, Earth-directed explosions could spark geomagnetic storms and auroras next week. The possibility of auroras is getting stronger for the next two weeks. A sunspot, called #484, was sighted this weekend by the orbiting Solar and Heliospheric Observatory (SOHO.) It has grown ever larger—almost the size of the planet Jupiter. It is now being called one of the biggest sunspots in years. These active regions may cause major CMEs (eruptions) as they rotate on the sun’s surface. If they occur at the correct angle to Earth and her magnetic field, then there’s a good chance for auroras. An explosion near #484 on Oct. 19 was not aimed at Earth, but the resulting large cloud may bounce off our magnetic field resulting in aurora activity in the next day or two. On the down side for Vermonters: with Vermont’s current weather of mostly heavy cloud cover and prediction of rain and/ or snow showers beginning tonight, Oct. 22 and for the next few days—we might not see anything except clouds, rain, or the early white stuff. Auroras were spotted in Arizona the night of Oct. 24. Usually, the best time to try to spot an aurora is about midnight local time. If the skies continue to be clear this weekend, keep watching and you may be lucky. According to Spaceweather sources, on Sunday, Oct. 26, the sun did indeed produce the expected activity. Each of the giant sunspots ( 484 and 486) produced an explosion that expunged CMEs (coronal mass ejections) that are headed somewhat towards Earth with the good chance of bouncing off her magnetic field. So, keep watching the night sky as the chances are very high for auroras in the next few days--not only in the usual high latitude US and Canadian areas but perhaps in the lower latitude US states and other countries as well. For Vermonters: Perhaps the current thick rain clouds will clear in time tonight for good sky viewing. Auroras (Northern Lights) are visible to the north and east, predominately red, with some green also. Post-Observation Notes: The above sentence was posted as soon as I got a local phone call to get outside quickly to catch the sky show. Sorry for the brevity, but I didn't want to miss anything! This turned out to be an amazing display in Vermont. Personally, I remained outdoors for over an hour watching the amazing show overhead until it finally dissipated and disappeared. The shades of red indicate the highest charged ion particles--in scientific terms, these are the most excited and active. As anyone fortunate enough to witness this spectacular event saw, the red colors were amazingly bright and filled a huge portion of the sky. The intensity, hue, and range of the red tones related to the size and intensity of the class of the sunspot explosion. The daily state newspapers all had front page, top of the fold color photos the next morning. The Burlington Free Press held a photo competition for the best aurora images taken by anyone witnessing the great sky show. One of the photos is posted here. Nov. 3, 2003- 8:45 a.m. The solar scientists have announced another aurora alert for Nov. 3 and 4, 2003. The incredible giant Sunspot 486 continues to be very active. Another large X8-class solar flare erupted from that sunspot on Sunday, Nov. 2. The sunspot has been moving and is close to Sol's western limb, so this eruption was not aimed directly at Earth. However, the CME (coronal mass ejection) is still heading toward our magnetic field. 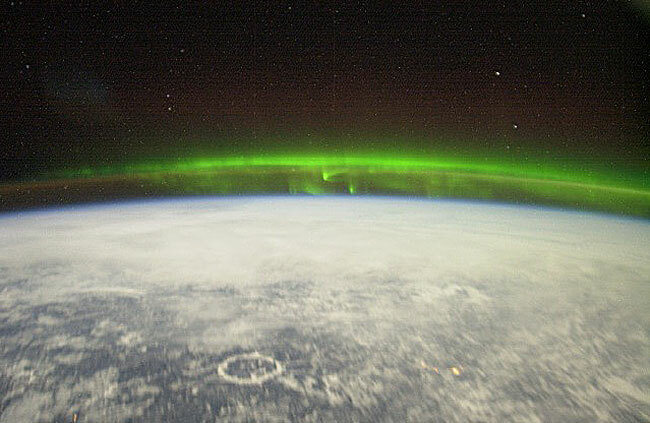 There are many classroom activities and resources available to use with your students related to the Sun-Earth connection and auroras. Vermont Space Education Program (VSEP) offers workshops to help you integrate this fascinating topic into your curriculum. This page last updated January 28, 2007. All rights reserved. No photo, drawing, or text may be reproduced in any form without written consent.